Happy Thanksgiving Monday to all my Canuck friends and family. Hope you are still eating yourselves silly today. It’s the one weekend you can eat like a linebacker and get away with it. So enjoy it while it lasts. Cuz you all know tomorrow is going to be all about a lot of us stepping on the scale and screaming. Our American friends will hear the collective gasps of horror and know their time is coming. Won’t be long till we’ll hear their screams next month. Today is The Secret Recipe Club reveal. This month I was assigned a fabulous blog called The Weekend Gourmet. I was thrilled to get Wendy’s blog. We also belong to Sunday Supper together so I was thrilled to see her name in my inbox. I just knew I was going to find tons of cool recipes to pull from. I mean she is a powerhouse in the kitchen. She cooks up meals and snacks and ice cream. 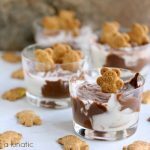 I was really drawn to her Wolf’s Wonderful Peanut Butter Brownie Fudge Sundaes but there’s not enough of us peanut butter lovers in the house right now. So I’m saving that until Christmas time. I want to make it for my brother when he comes over. He’s a peanut butter nut. After looking at tons of recipes and making myself seriously hungry I saw that she had a popcorn category. Naturally I went to take a look see. I knew immediately the s’mores had to be made. Such a cool idea. You know me and popcorn. It’s a huge love of mine. Like stalker kind of love. Like lock me up and throw away the key kind of love. I heard through the grapevine that popcorn is off limits to anyone with diverticulitis. I may have bawled like a little baby when I heard that. I could not wrap my head around a life without popcorn so I started doing some research, and by research I mean “google”. Turns out Dr. Oz says that popcorn thing is a rumour. Seriously, I now love Dr. Oz. Like stalker kind of love. Like stand outside his window and stare while eating popcorn kind of love. So I’ve tested it out and here’s what I learned. I can eat popcorn in moderation. I can eat popcorn if I am feeling well. If I try to eat it while I’m already flared up, well, that’s not a good idea. But day to day it doesn’t seem to bother me. I’m still in the learning phase so experimenting is how I figure out what I can eat and what’s off limits. I’m happy to report Lunie can continue her love affair with popcorn. And Dr. Oz. 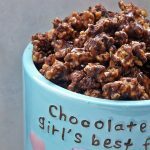 An easy recipe for s'mores popcorn that will make your family do the happy dance! Pop your popcorn ahead of time. I do mine old school on the stove. Take a large stockpot and pour vegetable or canola oil in the bottom so it covers the bottom of the pot. Turn on medium heat and let the oil get hot. Drop 1 cup of kernels into the stockpot, let them warm up without the lid for a little bit. Don't walk away of you'll have popcorn everywhere. Every now and again give the pot a little shake. Once the first kernel pops place the lid on the pot. Turn the heat down one notch. Allow it to pop like crazy. Right at the point it starts to slow down take it off the heat and allow the rest to pop. It helps to give it a shake now and again. Keeps it from burning, as does taking it off the heat towards the end. Now take 10 cups of popped popcorn and transfer it to parchment lined cookie sheets. You'll likely need two. Melt 8 ounces of milk chocolate and 2 tablespoons of butter in the microwave for about 1 to 1 and 1/2 minutes. Stir every 30 seconds. Drizzle over the popcorn. Pour half of your mallow bits over top. Take half of your graham bits and toss over top. Now repeat with the second half of everything. So repeat the chocolate step, the mallow step and the graham step. This just layers it nicely. You could just do it all at one time if you like. Stir it up really well. Toss the chunky pieces of chocolate over top so it sticks to the melty chocolate. Pop it in the fridge to allow it to set up. You can also leave it out on the counter to dry up a bit but it takes longer. Serve with a big old I Miss Summer smile! I used milk chocolate but you can use any type you prefer. Use really good quality chocolate. I popped extra popcorn for movie night so if you can use 1/2 cup for the correct amount of popcorn for this. Cool right. I just love me some funky popcorn. You can change this up and use dark chocolate. I know a lot of people love the dark and it does photograph better. But I’m a milk chocolate kind of gal. Just the way it is. Thanks to Wendy at The Weekend Gourmet for such a cool recipe. I did not change too much about it. I called it “slightly adapted” but that might even be a stretch. I only changed up a few minor things to suit my own taste. That’s the cool thing about recipes. People get all freaked out and intimidated by recipes, or won’t try something cuz they don’t like one ingredient. Live dangerously people. Change stuff up and experiment. It’s how you learn. Be fearless in the kitchen, if it fails just have your kids run to the store for more ingredients. I mean that is why we all have kids right.? To run errands for us once their old enough. If you’re kids aren’t old enough to run to the store just keep a place that deliveries on speed dial. See, I’m always helpful. Putting out fires everywhere I go. Miss helpful extraordinaire! Follow Kim Beaulieu | Cravings of a Lunatic’s board Snack Recipes on Pinterest. Yay…I’m so glad you had my blog this month! I’m 2-for-2 with Sunday Supper friends having my blog for SRC since moving to Group A. Isn’t this popcorn fun? 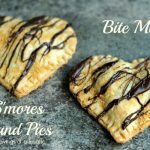 It was a huge hit when I made it for football munchies last year…might have to make a batch for this weekend’s game come to think of it!! I am so thrilled I got your blog. I had such a hard time picking which recipe I wanted to make. Love this popcorn. I have such a weakness for the stuff. Eating some now. Old school popcorn is the best, though it does take a tiny bit of effort. So what? The flavor is great! 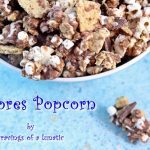 I’ve never had S’Mores Popcorn – cool idea. All of that flavor in one of my fav snacks (I really like popcorn too). Sorry to hear you can eat your popcorn only in moderation, but that’s way better then never having it again! Fun post – thanks. It really is. I love popping it on the stove. Although certainly microwave has it’s advantages. It was so good. I keep sneaking into the fridge to grab more. Thanks. I decided to make a roast today. I feel like a Thanksgiving slacker. Yum!!! Happy Thanksgiving Kim! Glad to hear that you can still eat popcorn and bring us all these yummy popcorn recipes 🙂 PS I <3 Dr. Oz too! He's awesome! Thanks Kels, you too! Hope you had a good weekend with the family. I was thrilled when I read it’s not necessary true for everyone. I just need to be careful. I also heard no nuts which would have just about ruined my life. Dr. Oz rules. I’m so happy you can still eat popcorn because I don’t know what I would do if I couldn’t eat all that amazing popcorn above! Seriously, I want to reach through my computer screen and eat it all! Thanks Susan. I was so horrified to think I can never eat it again. I’m sure I’ll need to experiment with my diet. They also say no nuts. Can you imagine me not being able to eat pistachios. Good lord. This sounds over the top amazing!!! I love all sorts of variations on popcorn. This is something I need to have immediately! Thanks Kate. I really love experimenting with popcorn. It’s so much fun. Well all those variations below today’s masterpiece look pretty darn enticing too! I am digging this popcorn sooooo much! Lol Uru. This is definitely a cheat day food. I never heard that about popcorn and diverticulitis! I remember growing up, when one doc. told me that there was the chance I might have it as it runs in the family, I was to stay away from tomatoes, seeds, etc. Thankfully, my side issues were due to something totally else and eventually subsided but if I was told then no popcorn, I would have lost my mind. 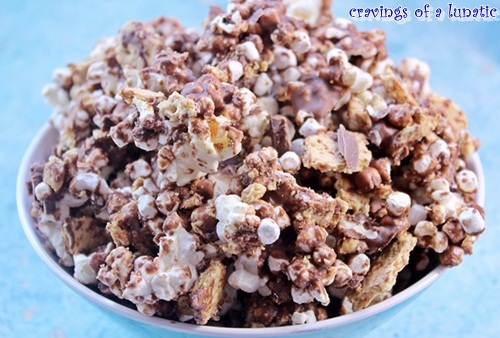 Now the fact that you have melded s’mores and popcorn – this is begging to be tried! Yup, they say no nuts, popcorn or seeds. Dr. Oz says it’s not true. Which I was so happy about. It’s a weird illness, I can’t eat some things for the ibs and some things for the diverticulitis so I’m still in the “wth can I eat” phase. I am so glad to know the stiletto fund has my back. I’m known to cause trouble everywhere I go. Also, this whole s’mores meets popcorn thing? Sign me up. And by sign me up, I mean mail be a big bucket of this stuff. Actually, scratch that. I need to behave for the next week after spending the past weekend stuffing my face with turkey and fixin’s, and last I checked, chocolate-covered popcorn doesn’t fall in the “behave” category. Sniff. Me too Izzy. I about died when I heard that. They said no nuts or seeds too so honestly I was traumatized. So happy to see I can still have it on occasion. I missed dinner this year. Doing a roast tonight for just me, mini-me and boytoy. But no big meal this year. I may try doing it in a couple weeks. I feel weird not having celebrated. Of course I miss the copious amounts of food. oh my gosh! this looks like some amazing popcorn, love it!! Thanks. I can’t stop eating it. It’s sorta addictive. I’ll order this in a large, please. Lol, I’ll take your large and raise you an XL. Muah! Oh my gosh! S’mores pocorn? Seriously?!!! How can such an amazing thing even exist! Lol, it’s so good Lisa. You have to try this. I had to send half of it away with my daughter’s boyfriend to stop me from eating it all. It’s so funky and fun. I just had a blast with this one. 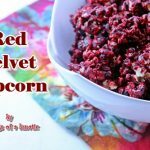 Your popcorn recipes are much better than any popcorn/candy store, Kim! 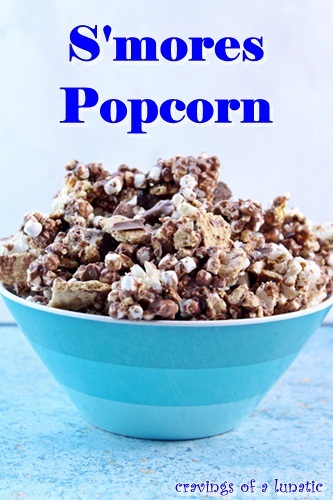 I have to make this smores popcorn because my son is really into marshmallow these days and he even started to enjoy rocky road. Sounds fun to make it together with him on weekend and maybe we call it movie day. Hope everything is well with you. Have been so busy and I haven’t checked how you have been doing but hope all’s well. Awe thanks Nami, you are so sweet. Your son would love this Nami. It’s super easy to make and would be perfect for a movie day. 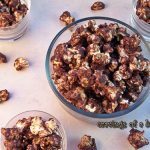 What a delicious twist to popcorn! Yum!! Where has this been all my life? Loving this popcorn! Great pick. I know right. I felt the same way when I made it. Lol. Well, chocolate and popcorns what more could I ask? Exactly Katerina! I like the way you think. 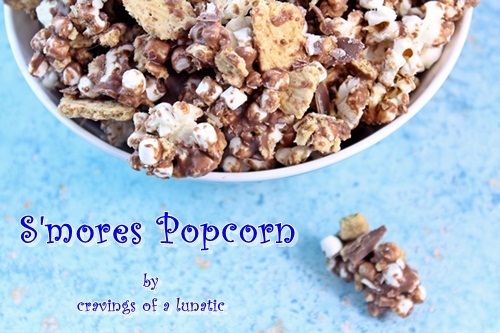 What a fun twist to popcorn! This is just perfect, K! Thanks so much. I had so much fun making it. Not gonna lie, had fun eating it too. Okay, okay, I totally am. I like to eat it almost as much as pistachios. Hugs right back at ya. OK..since I’ve been embroiled in work, the baseball play-offs and pinning the past week, I’m finally here to say (at 5 am no less lol) that I was so happy to get your blog! It was fun spending a month here, although I wish you could have left me some of this s’mores popcorn to nibble on while I perused! ;D Great choice..I definitely would have chosen it myself! I hope you get all of your photos back soon!! YUM! yum. yum. yum. This looks ridiculously good Kim! With Halloween coming up I am stalking your candy recipes like crazy 🙂 I can’t decide which to try first!